Canon Laser Shot LBP 1210 printer is one of the best printer for the printing Legal size paper from Canon family. Commonly the Canon LBP 1210 printer not showing legal size on page setup. Today we are sharing the solution for this problem. If you face any difficulty to printing legal size on Canon LBP 1210 printer, you can use these steps. You can add legal paper (8.50in Width , 14in Height) manually. Put legal paper size Width 8.50in, Height 14.00 in, and set margin size top 0.50", left 0.50", right 0.50", bottom 0.50". Then you may select Legal size paper in Canon LBP 1210 for printing. If you need Canon printer LBP 1210 driver for your operating system, can download from here. 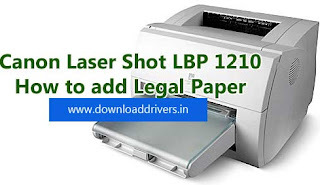 0 Response to "How to add legal paper size in Canon Laser Shot LBP 1210"